Today I bought an LP by the Dutch band Tower. 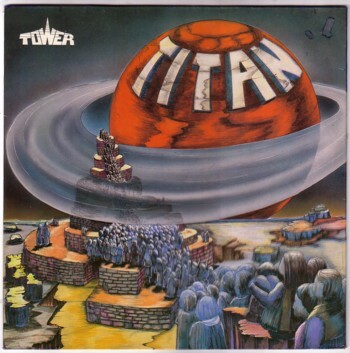 It is a concept LP called Titan , and the songs tell a story about boys and girls from the planet Titan, who visit Earth. Well, sort of. There is also a song about the Moon, that seems to have no relation with the rest of songs, and I am also not clear what to make of the song about the stranded space traveller, who is in telepathic contact with a girl from the planet X-I-O. The record was released in 1982. Not a great year for records. I bought this LP because it is about space (and because it was cheap), but it turns out a surprising good record. It sounds like the glamrock music that was popular in the seventies, which in my opinion is still highly underrated. 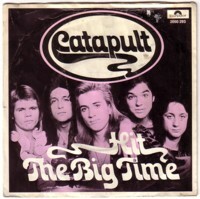 One song in particular, We are (the boys and girls) reminded me of a Dutch glamrock band, Catapult. Catapult had a handful of hits in Holland in the mid seventies, and their nameless LP is absolutely worth having. If you can find it, because for mysterious reasons it seems rare. The openings track on this LP is also their biggest hit, Teenybopper band, but the other songs on the LP are more serious. I like this kind of pre-punk music very much. It should be named glam-punk in stead of glam-rock. Anyway, while reading the song lyrics, which are printed on the inner sleeve, my eye fell on the name of the producer: Catmusic. Hey! 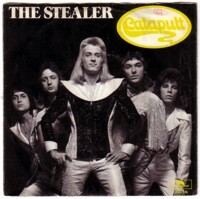 No wonder this LP reminded me of Catapult, one (or some) of the guys from Catapult were behind this record. One of the many projects that these guys are responsible for ( I just visited their website and I found out that they did a lot), is Rubberen Robbie. It started as a joke, a reaction on Plastic Bertrand, who had a hit with Ca plane pour moi , if you can remember him. But Rubberen Robbie was so successful, that they made 6 LP’s and 17 singles. I have most of these records (I thought I had them all, but I sure don’t have 17 singles) and if there ever was a promotional campaign for alcohol, it was Rubberen Robbie. It is all in Dutch and difficult to explain, so I won’t try that. But if you are in Holland, buy a Rubberen Robbie LP and a dictionary, and then mail me what you think of that music. 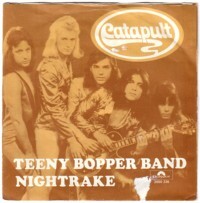 Here is Catapult at their best, in Teenybopper band.